My favorite part of artmaking is the transformation that mural art brings. The ugly eyesore becomes a beautiful focal point. Unnoticed becomes noteworthy. This birth of beauty, engagement, and delight in a neglected space, particularly in public spaces, is why I paint murals. Sometimes I’m surprised that the turnarounds I have come to expect still surprise other people. Before and After, Fontana Park water vault. Public entities like Caltrans, PG&E, the water district, as well as some city governments and school districts may be “art ambivalent”, but the fact is they own A LOT of the ugly canvases that are ripe for bringing transformations through art into our communities. Key decision makers may not be familiar with the upside of public art if they haven’t experienced a community art success story firsthand, but they can imagine many potential risks: fear of inappropriate art, tagging, copyright lawsuits, not being able to paint over the artwork at the end of its life cycle, etc. Where I see an abundance of blank walls as opportunities for transformation, many decision makers see an opportunity for problems. I wonder if one of the primary obstacles might be overcome by educating decision makers what is possible, (mural art deters tagging, improves individual well being, unifies communities, improves the local economy, academic performance, tourism, and sparks creativity to name a few) and also to share best practices that ensure positive outcomes so that key decision makers can make an easy and informed choice where everyone wins. A cumulative of 600 hours of artist time for their labor in creating their designs and painting the murals. 250 hours of staff time for project management and coordinating all the logistics. This does not include the help and time from the Anti-Graffiti team for applying the protective clear coat (at a cost of about $11,000), or all of the volunteer hours that stakeholders have put into this. I can’t help but wonder if the benefits and opportunities of public art were better articulated to the “general public”, (particularly those who enjoy art), then the increased public awareness would lead to public pressure on decision-makers and organizations like Caltrans, the Water District, PG&E, school districts, and intra-governmental agencies to create better systems and streamlined processes – wherever and whenever possible – to support more art getting made. 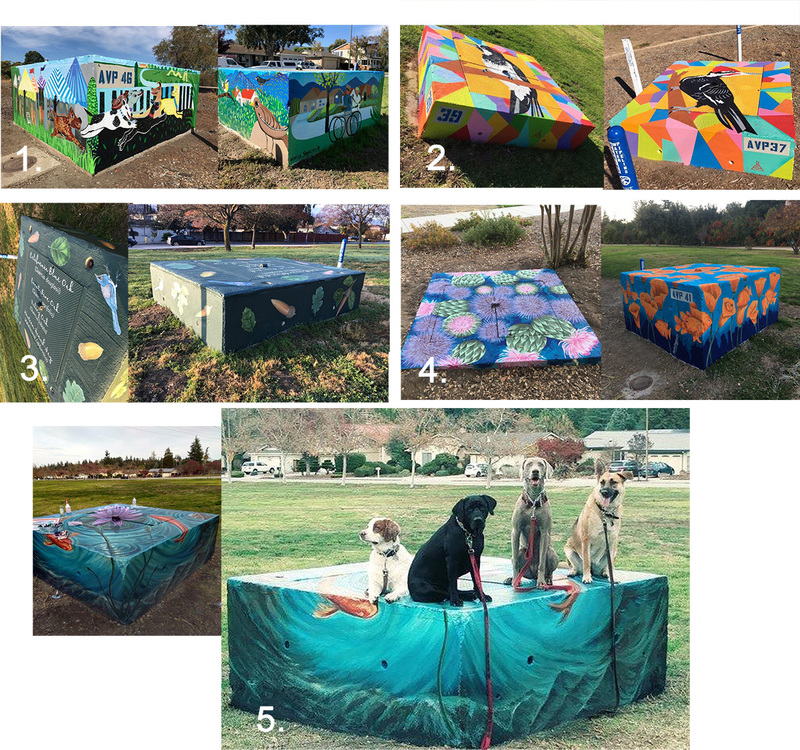 The impetus for the water vault project came from the Fontana Parks Neighborhood Association who organized and lobbied their local representatives to have art in their park. Grassroots art advocacy is at the root of every public art project that happens. Despite the extensive coordination effort required, the vaults came out beautiful. Local residents are thrilled with the colorful vaults they now enjoy on their daily walks. Artwork by (1. )Vanessa Stevens (2. )Oree Originol (3. )Jane Kim (4. )Megan Stevens and (5. )Andrew Kong Knight. My husband will be the first to tell you: I am not a patient person. I would have given up after 5 emails in Michael’s process. I want to advocate for what I see as the amazing potential for transformation in our public spaces but art advocacy seems, honestly, like a slog. I brainstormed on how I might best share my enthusiasm for (and firsthand experience of) the transformative power of public art without spending my weeknights at city council meetings, citing statistics under fluorescent lights. 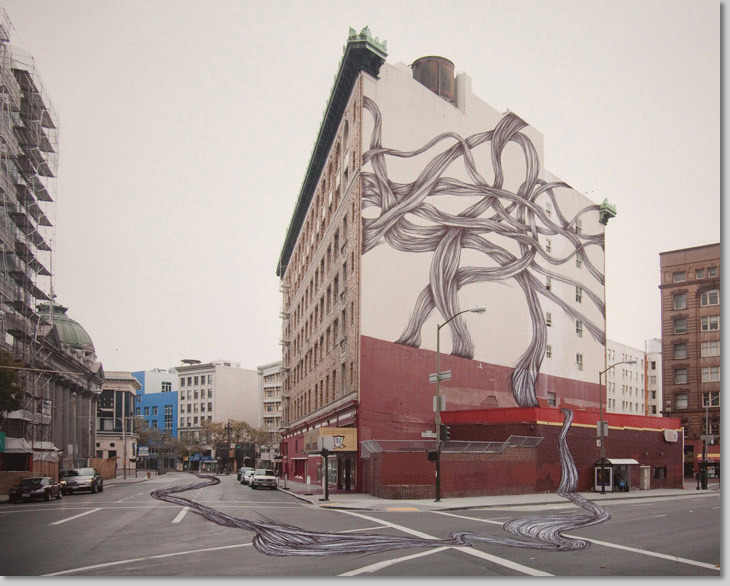 Paz de la Calzada, Tenderloin Dreamscapes, a video animation in San Francisco. “Circut Board Schematics” and “Motherboard” wallpaper by Shannon Geis. One of my favorite ways to learn something new these days is to listen to podcasts. It occurred to me a podcast might be an enjoyable way for me to be useful; I could just turn on a mic and share a cup of tea with an artist or art advocate and learn about what is working, what isn’t, and where the opportunities are to get more mural art made. If These Walls Could Talk is my answer to art advocacy, by communicating the transformational opportunity of public art, especially for the San Jose and peninsula communities, and sharing information around best practices for successful projects. 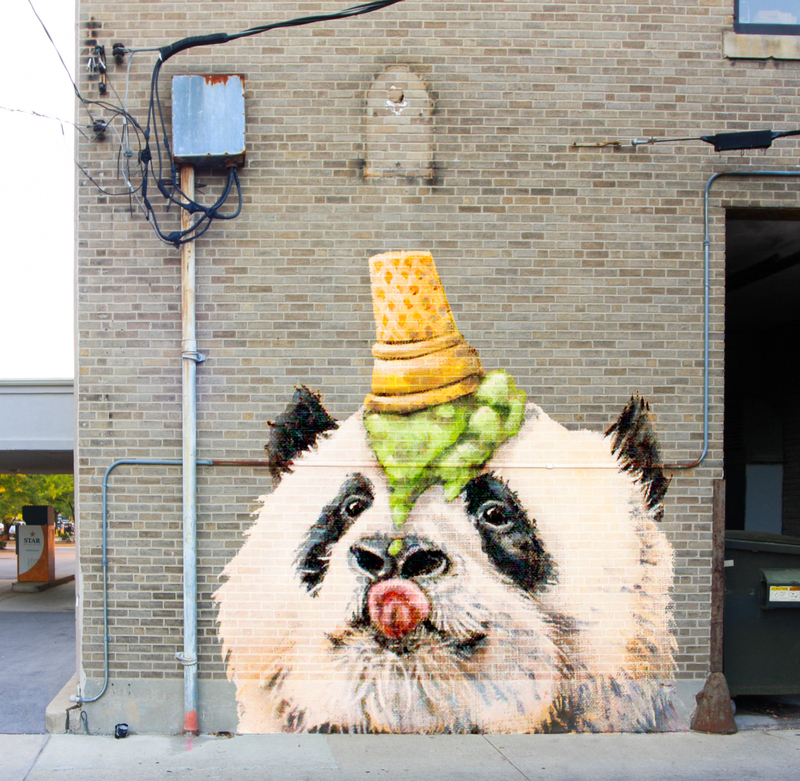 “Panda” by Tammy Davis, Fort Wayne, Indiana. It would be an act of generosity, and art advocacy, to subscribe to the podcast, listen to an episode, rate and review it. The reviews will help me understand what was – and was not – useful, and the subscriptions help other people find my podcast. “Art transformation facilitator” is not a business category with the IRS, and neither is “podcast host”. (I was working on my taxes today, it’s not there.) Some changes are worth fighting for, others not so much. My hope is that through the stories and insights of artists and art advocates, the transformative power of art (and how it happens) can become common knowledge, and more great art can get made. Art matters.